If you’ve come to this post via my ARTSY NEWS, this is the continuing story of my good fortune finding this Mabef easel and the wee bit of surgery I had to perform to get it strong and functional. 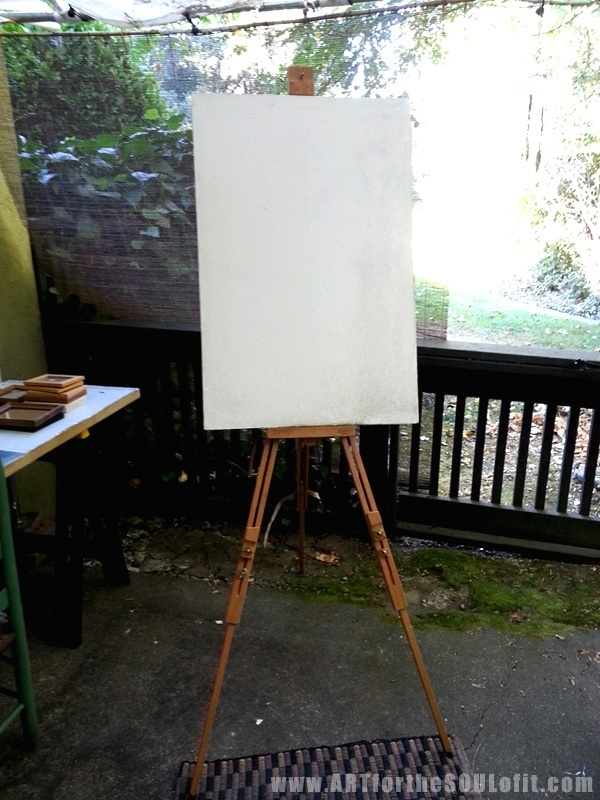 Here’s a pic of it from the Mabef site – it’s called a MABEF M32 Giant Field Easel. (Full retail lists at $215, but you see them on sale for $112 and up.) The absolutest coolest thing about it is that it is 8.5 lbs, and very easy to fold down and carry. Also, to my surprise, didn’t realize it until I got it home, the main staff tilts to complete horizontal position. 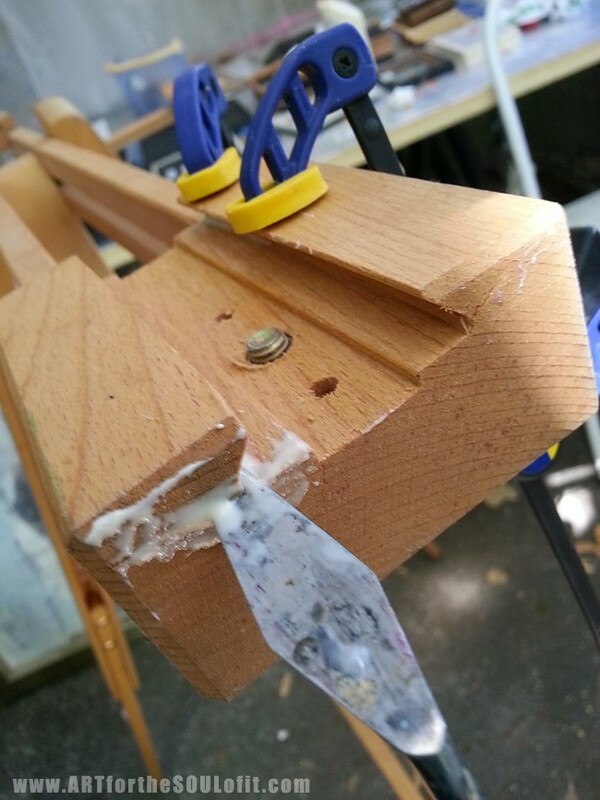 That means I can wax, varnish, add mixed media….it just means COOL. And this thing stands rock solid sturdy. Even with a very large canvas on it. 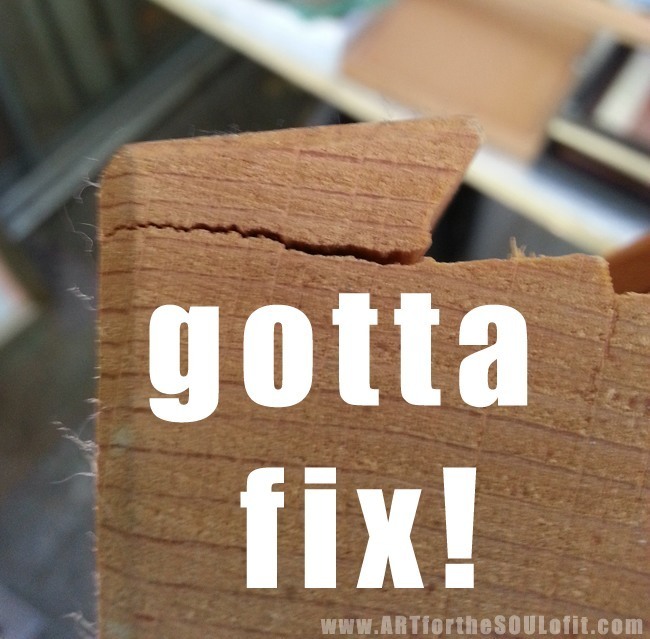 So here are some of the “fix its” that this Tool Girl made with the very fewest of supplies: wood glue, clamps, and a handy dandy palette knife. 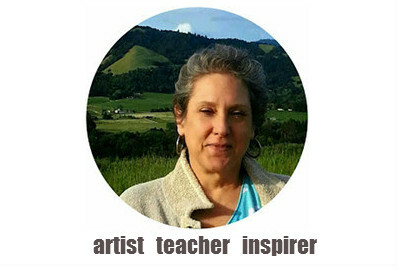 Shown with an old 36″ high canvas. 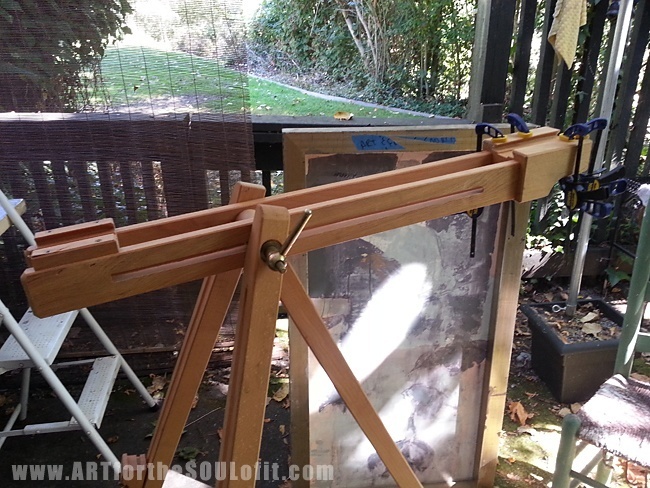 The Mabef site says this easel can accommodate a 78″ easel! Oh my. Not sure how or if I’ll ever work on anything quite that large…but wow. 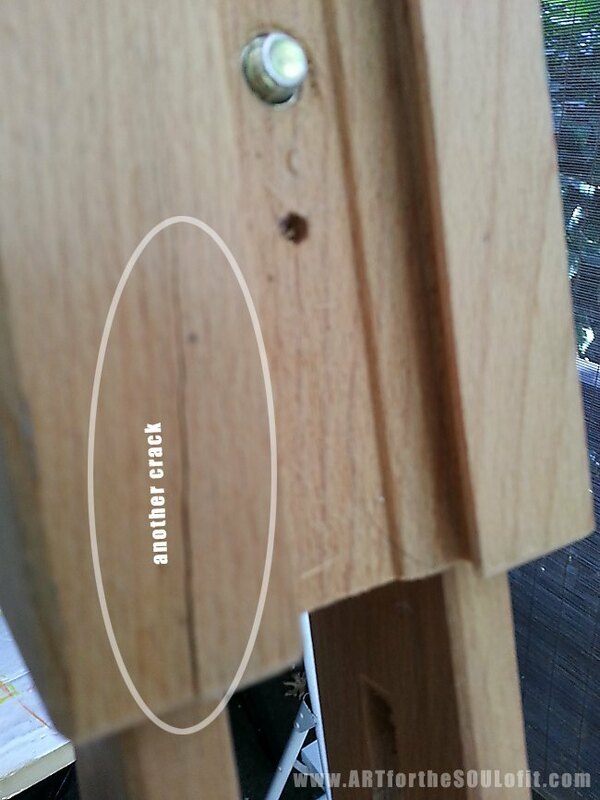 Both cracks were on the main staff…or the sliders really. I don’t know “easel terminology.” But super duper easy to fix. Who knew how handy palette knives were for fixing things! Like squeezing glue into tight places. 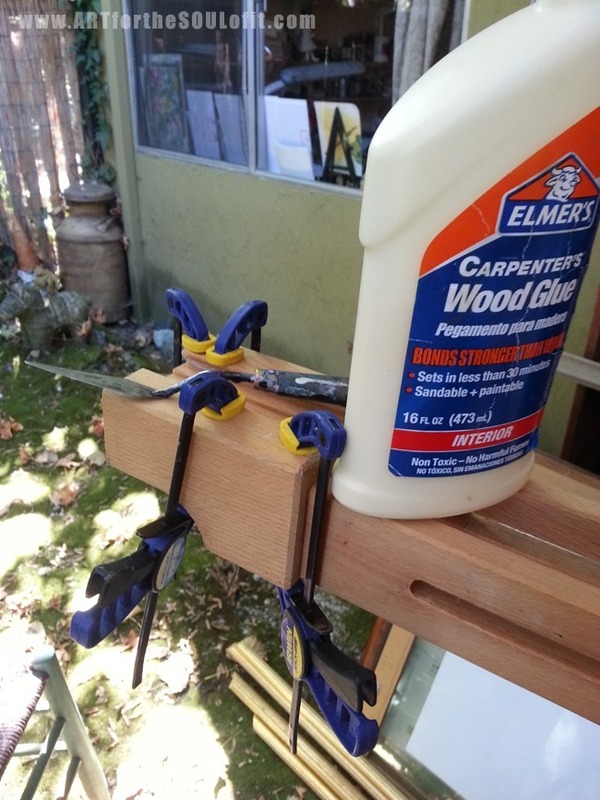 I can’t live without clamps, seriously. Handiest tool ever, well, maybe after hammer and nails! 24 hours later, my easel is PERFECT and ready to go. And the cute little thing all folded and belted up, ready for traveling or some plein air. I think it may size down a bit more in height, but that was just a simple first try. Only 8.5 lbs. Not bad. And STURDY! I’m thrilled. The only thing left to do BEFORE I can start playing around with painting LARGE, is fix up my patio studio. I’ve got some great ideas brewing…..maybe next week I can do a reveal. Meanwhile, Blessings!